I’m a completest. Sometimes that means seeing the newest movie in a series ASAP. Sometimes it means watching all the SAW films long after they have stopped being entertaining. And sometimes that means watching two ALIEN VS. PREDATOR movies within a 24 hour period. I watched ALIENS VS. PREDATOR: REQUIEM (2007) on 10.17.15. It was my first viewing of the film. The opening moments of this second AVP film at least show a concern for quality higher than that of its predecessor from three years prior. We start in the moments after the previous film ends. An Alien busts out of the chest of a Predator – a PredAlien – and is loose on a ship. The Predators fight it, but end up crash landing on Earth. The CGI is a step up and the overall look of the film in that first couple of minutes gives a stronger impression than the first one did in almost two hours – particularly the graphics interface for the Predators feels like something that honors the original film without feeling like it is stuck in Earthbound technology. But would it last? Also, a bit of a confession here, I was rooting for this to be a good movie. Reiko Aylesworth was a favorite of mine from her days on the Kiefer Sutherland show 24. I wanted her to be good, and I wanted her to be in a good movie. She plays Kelly O’Brien, here, a soldier returning home from war, a mother, a wife. In a convergence of TV shows, her husband is played by the immensely likable Sam Trammell of True Blood fame. Unfortunately, the movie spends far less time with their story than they do with some of the other drama. The movie brings us that drama in a small town in Colorado. There is the bad boy, Dallas (Steven Pasquale), returning home to be met by a sympathetic Sheriff (John Ortiz). And in a contrasting storyline, there is a young kid named Ricky (Johnny Lewis) who, in a harmless moment of cliché, likes a girl (Kristen Hager) who has a mean boyfriend who beats up Ricky for making a harmless joke. These stories converge as Dallas and Ricky turn out to be brothers. The visual style of these movies are far different from other ALIEN or PREDATOR movies. The directors, who call themselves The Brothers Strause, are not afraid to put a lot of popping color in a shot. They make, here, a movie for a big screen to be sure. They also are able to return the series to an R rated world, something they neither abuse nor take for granted. This film may look a little different from the others (at least partly due to the small town setting), but at least it feels like it belongs to these franchises. As long as Earth is the destination, it will always be more of a Predator movie than an Alien movie, but that is okay since we are asked to consider the Predators our protagonists – though much less so than in the first AVP. This idea, though, of this being a Predator movie is further accentuated here due to the fact that the first film had young Predators learning to hunt, whereas this film has an experienced Predator adept at killing Aliens. Earth, in this second AVP film, may as well be home to the Predator. It takes a bit of time for the action to truly start. The timing of it all is predictable. Once we have gotten to know the humans a bit (and this is a pleasant surprise after the indifference of the first AVP), we know the encounters are due. Halfway through the film, everything is all tease and potential as our central human characters all remain dumb to the truth. Once all the loose strings come together the movie doesn’t necessarily improve, but at least we get all of these folks together in the town and fighting back against… something. 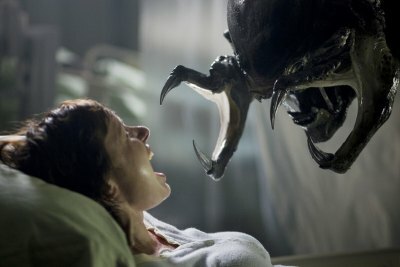 This movie does a far better job of balancing the humans with the Predators and Aliens. We at least care about these people, even if the high school story gives us a bunch of predictable tropes. Widening the scope to an entire town – but a small town – gives the movie room to breather a little bit. Where the word of the day for AVP was ‘claustrophobia’, the word that best describes this second AVP would be ‘contain’. That makes for a more enjoyable movie, at the very least. The PredAlien villain is cool, but underutilized. The movie works despite having a bunch of generic characters. Maybe the bar was set REALLY low by AVP, but this second movie at least feels like something worth visiting. It at least honors the series’ from which it was born. Would I come back to this movie a bunch? No. But it’s certainly likable enough. ~ by johnlink00 on October 17, 2015.